This dish. It’s my favorite of the favorites. 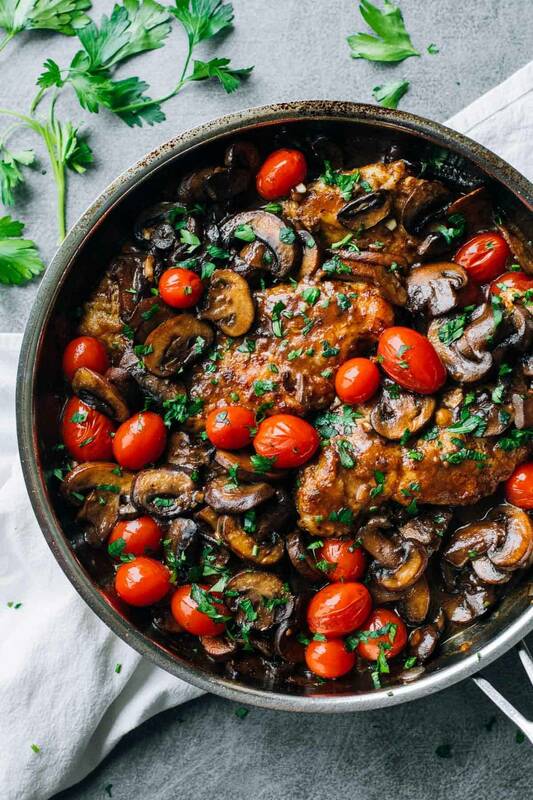 Pan-fried chicken breasts (hi ♡) and buttery wine-soaked mushrooms and blistered, bursting cherry tomatoes get all covered in a luscious – there is no other word for it – marsala wine sauce (!!) and then sprinkled with a handful of fresh parsley. I dunno, we needed something green in there. The story with the recipe? Let me just say: Shauna would be so proud of me. And from now on, we’re just going to talk like I know her kthanks. 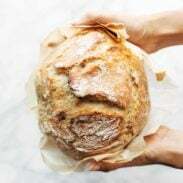 After reading the book Bread and Wine, I felt so inspired to really take my love of food and run with it. Like, to use my always-thinking-about-food-brain for something good, like having friends and neighbors over. Or connecting with people, like talking about the fact that dark chocolate with sea salt is simply just better than anything else, and how Chipotle now serves tofu, and why I should never make a whole roasted chicken ever again under any circumstances EV-ER. Or maybe just feeding people as a way to say, Hey. I love and appreciate you. With sauteed garlic butter wine-soaked mushrooms. Mwah. Taking inspiration from the book, a few weeks back I decided that I was going to start having a group of friends over – six friends who don’t all know each other or aren’t in the same groups necessarily, but friends that I know individually. Step one: know your own friends individually. Yahssss. I’m winning. No, but seriously, these girls (ladies? dare I say we might be considered LADIES? 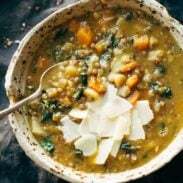 yeesh) are all so different and wonderful each in their own way – some of them young moms and a few of them thriving business owners and a few… okay ONE of them a sassy chic professional (luv you, Little One), and for surely ALL OF THEM foodies. So naturally things went well, starting with the bacon wrapped dates stuffed with goat cheese (dead on the floor.) and ending with the world’s thickest, fudgiest peppermint brownies. Oh my goodness gracious, these are my food people. For the main dish, I had this great idea to make a brand new-to-me recipe — Chicken Marsala, to be exact — when all my friends came over because I like to test my own stress limits or something like that. In a moment of not-myself-ness, I actually did some research in advance and made a halfway version of this recipe “to practice” before my friends came that involved a Marsala mushroom sauce sans-chicken, but heaped on baked potatoes: YUM. I got super confident, and in a moment of my regular-self-ness, I decided to wing it the night of the party. And guess what? Success of all successes. It turned out beautifully even though I was making it primarily by look, feel, smell, and taste. I mean, making Chicken Marsala by feel for a crowd of seven people without a real recipe and not burning the house down or breaking anything in the process? I think I just became a real adult. And this is 99% weird of me, but, um, it’s Christmas colors. You saw it, too? Ugh. I KNEW you were like that. A simple Chicken Marsala recipe featuring fresh tomatoes, pan-fried chicken breasts, sauteed mushrooms, and a Marsala wine sauce. Heat 1 tablespoon butter in a medium or large saucepan over medium heat. Add the mushrooms and saute for 8-10 minutes, until golden brown. Love this, and your dinner party strategy of bringing together different friends! It’s totally going to happen over here too. This is the best looking chicken marsala I’ve ever seen. Hands down. I mean, who need Chipotle? (Okay, we do!) Drooling right now. Lighting up like the 4th of July and really wondering if I can make this and will it taste as good as yours?!? The vibrancy of the colors in these photos is just stunning! I love that you started a cooking club like the one from Bread and Wine! I’ve been wanting to start one too, and this was just the additional push that I needed! I can hardly image a better way to instantly bond a group than with buttery drunken mushrooms. It’s an “I love you, let’s be friends forever” in a pan. YUS. Totally saw the Christmasy thing goin on. I see what you did there you sneaky Christmas ninja you. And there is also the word drunken, which is festive and relates to Christmas, so this GORG chicken dish is basically perfection. P.SSSSSS!! Bacon Wrapped Goat Cheese Dates? HOLY YES. Pinned! Looks way better than any Chicken Marsala recipe I’ve had at a restaurant! I WILL be making this soon! I’ll take all. the. mushrooms. Thank you for reminding me of this dish! I haven’t made it in years and love it! Buttery, garlicky, wine filled mushrooms. I’m in heaven. Love that! hope you guys like it. i m sure anyone will be friends with this pan of chicken..looks so damn delicious! This looks perfect for girls night! And seriously, what is it about trying new recipes when friends come over? I do that ALL the time lol, but this dish looks like a total win! My god! Get in my mouth! Your pictures get prettier and prettier by the day! If there’s anything that could bring wildly different personalities together, it’s good food!! The rich colors in this are gorgeous! I always pass on recipes for this dish because I never feel like making the special trip to get the Marsala…but I think it’s time to make the trip soon…this one looks too good to pass up! Yep – just stock up on a few bottles and you’ll be good to go! You had me at the buttery wine-soaked mushrooms…. Looks delicious….but, why don’t you ever want to roast a chicken again? Oh my gosh, such a mess. There was oil splattering everywhere, and I don’t love chicken to begin with so to have to handle a whole raw chicken and like, pat it down with paper towels and stuff? Bleh. I hated it. and then it was undercooked. ultimate fail, basically. I have to say I find it hilarious that someone who can’t cook a roast chicken, and who finds it “Bleh” to touch a raw chicken, has a food blog and thinks that she should give advice to anyone else about cooking. A roast chicken is Cooking 101 and is quite simple really. Your photos are quite pretty, and I’m sure you are a lovely person, but giving cooking advice to others is just too funny. I hope some day you actually can cook at a level that suggests you have earned the right to help others on their cooking journeys, but that time is obviously not now. I wish you well. Dianne, lighten up. ‘I hope someday you actually can cook at a level that suggests you’ve earned the right’…blah blah blah…. Seriously? Who LOVES pawing over a slimy chicken breast…they’re gross! Get over yourself. Sheesh….trolls…. Lindsay, it sounds delicious! Next dinner party, this’ll be my main. Cheers! Lindsay actually is qualified to impart advice, as she has already made this recipe…as I’m sure Diane realized. It is beautiful and flavorful…. the exact type of meal that makes me happy! I don’t believe anyone is waxing romantically about touching raw meat, by the way. My Grandma never enjoyed it either… and trust me she could have given credible advice on anything…including how not to be a troll! Cost effective whole chickens – I only cook it in the crockpot with lemon, onion and fresh herbs if I have them. Easy Peasy. After our dinner, I usually get 3 to 3.5 cups of diced chicken and about 1.5 cups of rich broth. It all goes into the freezer to come out for chicken pot pies, chicken salad or chicken noodle soup. So Easy!! By the By, this recipe looks scrumptious. Can hardly wait to try it. Oh my goodness…if we were to become, say best friends, would you make me and send me some of this chicken like asap? K thanks. 😀 This whole dang gorgeous skillet is just speaking to me and kinda begging for a faceplant if you know what I mean. 😉 Pinning! I know – I am thinking it might make a holiday appearance for us as well! Nice take on a classic. I order chicken marsala often when I eat out. Oh my gosh, this looks beyond incredible. Love all the extra add-ins too. Yum! You instantly had my attention with all of those mushrooms – this looks incredible, Lindsay! Wow wow wow – that chicken marsala looks absolutely beautiful and absolutely needs to be made in my kitchen. Perfection! I must be terribly out of the loop because I don’t know of this book, Bread and Wine. But I think I need to! And I need to make this delicious looking chicken marsala. Going on my list right now! You do need to! 🙂 It’s my fave. Love this recipe…sounds delicious! I love the mushrooms and tomatoes blended into the flavor of Marsala wine…thanks for sharing!